American physician payload specialist astronaut 1984-1991. Status: Inactive; Active 1984-1991. Born: 1946-06-09. Spaceflights: 1 . Total time in space: 9.09 days. Birth Place: Carlsbad, New Mexico. PERSONAL DATA:� Born June 9, 1946, the oldest of five children, in Carlsbad, New Mexico. �His father, F. Blair Gaffney, is deceased; his mother, Miriam Julia Gaffney, lives in Carlsbad. �He is married to the former Elizabeth B. Sims of Berkeley, California. �They have two daughters and a son and daughter, respectively. �Dr. Gaffney enjoys sailing and traveling. �His hobbies include bicycling, photography, scuba diving and reading. EDUCATION:� Graduated from Carlsbad, New Mexico High School in 1964; received a bachelor of arts degree in psychology, University of California, Berkeley, 1968 and a doctor of medicine degree, University of New Mexico, 1972. �Internship and residency in internal medicine, Cleveland Metropolitan General Hospital, 1975, and a fellowship in cardiology, University of Texas, Southwestern Medical Center, 1977. ORGANIZATIONS:� American Heart Association, Council on Circulation; American College of Cardiology (fellow); Aerospace Medical Association; Dallas County Medical Society/Texas Medical Association; American Federation for Clinical Research; American Institute of Aeronautics and Astronautics; American Society of Echocardiography; Society of Air Force Flight Surgeons. PUBLICATIONS:� Dr. Gaffney has more than 100 publications in the areas of cardiovascular regulation, space physiology and patient safety. SPECIAL HONORS:� Inductee, International Space Hall of Fame, Alamogordo, NM, 1996; NASA Group Achievement Award, Spacelab Life Sciences-2 JSC Payload Project Team, 1994; Kilby Award for Technology Achievement, 1992; NASA Group Achievement Award, Spacelab Life Sciences-1 E-294 Experiment Team, 1991; Aviation Week and Space Technology, Aerospace Laurels Award, 1991; NASA Space Flight Medal, 1991; Distinguished Alumnus, University of New Mexico School of Medicine, 1989; Distinguished Graduate, USAF School of Aerospace Medicine, Primary Course, 1986; American Heart Association, International Scientist, 1983; Award for Outstanding Teaching and Clinical Service, Division of Cardiology, University of Texas, Southwestern Medical Center, Dallas, Texas, 1981; National Institutes of Health, Individual Post-Doctoral Research Fellowship, 1977; American Association of Medical Colleges Public Health Fellowship Award, 1970. EXPERIENCE:� Visiting scientist at August Krogh Institute, University of Copenhagen, Denmark, 1978 to 1979; assistant, associate and professor of medicine, University of Texas, Southwestern Medical Center, Dallas, Texas, 1979 to1992.� A colonel in the Texas Air National Guard, Dr. Gaffney served as a senior flight surgeon-astronaut for the 147th Fighter Interceptor Group at Ellington Air National Guard Base, Houston, Texas, 1986 to 1993 and as a reservist at Brooks Air Force Base, San Antonio, Texas, until his retirement from the USAF in 2007. NASA EXPERIENCE:� Dr. Gaffney served as a visiting senior scientist with the Life Sciences Division at NASA Headquarters from June 1986 to June 1989. �He worked with the Operational Medicine group and was associate manager of Biomedical Research as well as program scientist for the D-2 Spacelab mission and the Research Animal Holding Facility. �He was a member of several working groups and implementation teams planning collaborative research with German, French and Soviet government scientists. �He also served on a number of space station and advanced mission planning groups, including the ��Humans to Mars�� study group, which was charged with outlining the components and timetable for a series of flights to Mars. Dr. Gaffney's experience in cardiac research and experience in echocardiography and human physiology led to his being selected as a payload specialist astronaut on the June 1991 STS-40 Spacelab Life Sciences mission (SLS 1), the first shuttle mission dedicated to biomedical research. �Dr. 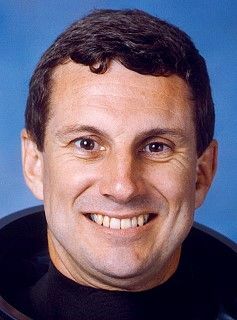 Gaffney was a co-investigator on experiments that studied human cardiovascular adaption to spaceflight and included the first invasive measurements of central venous blood pressure through a catheter placed in his heart several days prior to flight and removed after in-flight measurements were completed. �The SLS-1 mission flew more than 3.2 million miles in 146 orbits and its crew completed over 18 experiments during a 9-day period, bringing back more peer-reviewed, published medical data than any previous NASA flight. �The mission duration was 218 hours, 14 minutes and 20 seconds.� Following this flight, Dr. Gaffney became a member of the Institute of Medicine's Committee on Space Biology and Medicine, serving from 1992 to 2000.� He is a professor of medicine (cardiovascular disease) at Vanderbilt University and continues to serve as a consultant and reviewer for human spaceflight-related studies. This is the only version available from NASA.� Updates must be sought direct from the above named individual. Francis Andrew Gaffney, M.D. was born in Carlsbad, New Mexico. Gaffney graduated from Carlsbad High School in 1964, received a bachelor of arts from the University of California-Berkley in 1968, received a doctor of medicine degree from the University of New Mexico in 1972 and received a fellowship in cardiology from the University of Texas in 1975. He completed a 3-year medical internship and residency at Cleveland Metropolitan General Hospital, Cleveland, Ohio, in 1975, and went on to receive a fellowship in cardiology at the University of Texas' Southwestern Medical Center in Dallas, becoming a faculty associate and an assistant professor of medicine there in 1979. From 1979-1987, he served as assistant director of echocardiography at Parkland Memorial Hospital, Dallas. Gaffney served as a visiting senior scientist with NASA from 1987-1989. He was a co-investigator on an experiment aboard STS-40 that studied human cardiovascular adaptation to space flight, and served as Payload Specialist 1 (PS1). Family: Astronaut. Country: USA. Flights: STS-71-E, STS-40. Projects: STS. Agency: Parkland Memorial Hospital. Bibliography: 12, 5413. 1946 June 9 - . Birth of Dr Francis Andrew 'Drew' Gaffney - . Nation: USA. Related Persons: Gaffney. American physician payload specialist astronaut 1984-1991. 1 spaceflight, 9.1 days in space. Flew to orbit on STS-40 (1991)..
STS-71-E (cancelled) - . Crew: Gaffney, Phillips. Backup Crew: Hughes-Fulford. Payload: SLS-1. Nation: USA. Program: STS. Flight: STS-71-E. Spacecraft Bus: Shuttle. Spacecraft: Challenger. Planned SLS-1 shuttle mission. Cancelled after Challenger disaster. .
1991 June 5 - . 13:24 GMT - . Launch Site: Cape Canaveral. Launch Complex: Cape Canaveral LC39B. Launch Platform: MLP3. LV Family: Shuttle. Launch Vehicle: Space Shuttle. STS-40 - . Call Sign: Columbia. Crew: Bagian, Gaffney, Gutierrez, Hughes-Fulford, Jernigan, O Connor, Seddon. Payload: Columbia F11 / GBA-2. Mass: 11,767 kg (25,941 lb). Nation: USA. Related Persons: Bagian, Gaffney, Gutierrez, Hughes-Fulford, Jernigan, O Connor, Seddon. Agency: NASA Houston. Program: STS. Class: Manned. Type: Manned spaceplane. Flight: STS-40. Spacecraft Bus: Shuttle. Spacecraft: Columbia. Duration: 9.09 days. Decay Date: 1991-06-14 . USAF Sat Cat: 21399 . COSPAR: 1991-040A. Apogee: 296 km (183 mi). Perigee: 287 km (178 mi). Inclination: 39.00 deg. Period: 90.40 min. Carried Spacelab life sciences module. Payloads: Spacelab Life Sciences (SLS)-1 with long module, getaway special bridge assembly with 12 getaway specials, Physiological Monitoring System (PMS), Urine Monitoring System (UMS), Animal Enclosure Modules (AEM), Middeck Zero-gravity Dynamics Experiment (MODE), 7 Orbiter Experiments Program experiments. 1991 June 14 - . Landing of STS-40 - . Return Crew: Bagian, Gaffney, Gutierrez, Hughes-Fulford, Jernigan, O Connor, Seddon. Nation: USA. Related Persons: Bagian, Gaffney, Gutierrez, Hughes-Fulford, Jernigan, O Connor, Seddon. Program: Spacelab. Flight: STS-40. STS-40 landed at 15:40 GMT. .